I made this on the week end. It is not done yet but almost. I have to paint the dowel and the base that my dad has helped me with. I have the parts on a dowel to show you what it looks like. It is a gift for a another sister in law. She already has a pot cover like I showed last week. I am going to add my post to Judy's Design Wall Monday. Check it out Here. I was inspired by a tin decoration I saw at Canadian Tire but knew I could make one in fabric. First I drew out a pattern and made plastic templates. 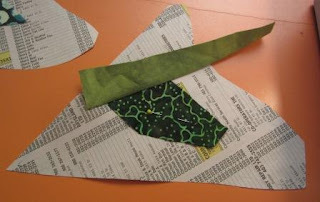 I drew the first shape on to phone book pages like Bonnie Hunter at Quiltville would do. I did flip and sew on to the paper. I did two pieces that are mirror images of each others. I used fusible stiff stuff. I forget the name of it. The tag on the roll I have is long gone. 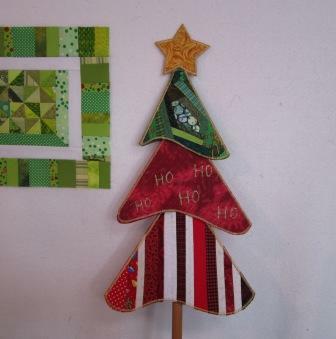 I layered each piece of patchwork with a new backing and quilted each piece. Six tree pieces and two star pieces. Once quilted I cut out the correct size and shape. 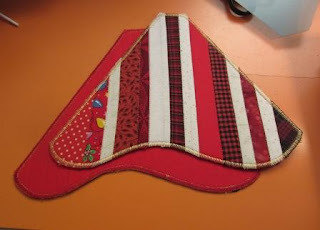 All of the patch work that I did was from my scraps of red and green. I had them out because I was going to do a red block and green block for the Rainbow scrap quilt. 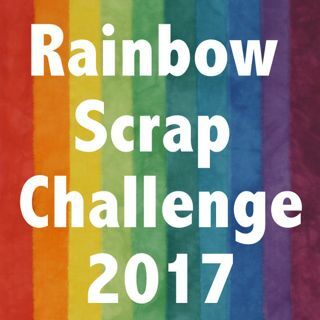 That quilt has been inspired by Soscrappy and the ScrapHappy Saturday Here. She also has a give way to celebrate 1000 posts. I then stitched a zig zag around the outside edges in gold thread. 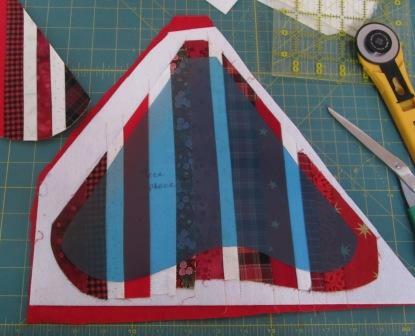 Then I stitched the two halves together leaving a hole at the top on the two bottom units. The star also had a hole at the bottom and was stitched to the top of the tree. The dowel will then hold each piece in place. I am going to go paint my dowel and base today and when dry I can do the final step. I am hoping I can use a glue gun to get each unit to sit on the dowel were I want them too. Super cute tree. I love that each layer is different. So festive! I love this! How fun. Beautiful and original! I love the 3D effect. Very clever and cute too! So creative! Love the green block on the wall! Very cute! Love that block on the wall, too.